Katherine and Michelle in Vegas! I always like to have a vacation to look forward to while I am working like crazy during busy season. Vegas is known as a place to have fun and let loose. 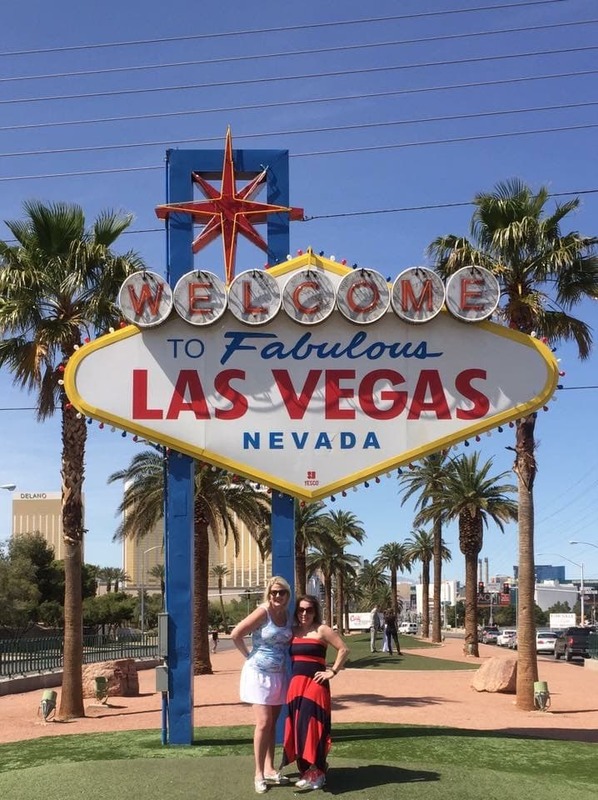 Since I found a good flight on Southwest and my friend, Michelle, had a flight credit that she needed to use, we decided to plan a trip to Vegas. I generally enjoy planning trips –choosing activities, perusing menus, and picking bars. Advance research is definitely important to maximize your fun in Vegas, especially when it is a quick trip. Otherwise, you are gambling – and I’m not talking about playing the slots! I wanted to share five Las Vegas trip planning tips that will save you money and time. We were looking to do an affordable quick two night trip to Vegas. Neither Michelle nor I are gamblers, so we were interested in getting some sun, having a few (too many) drinks, eating some delicious food, and seeing some of the sights in Vegas. When you are planning a Las Vegas trip, the location of your hotel is key. It may look like one hotel is right next door, but that “next door” is probably still a 20-minute walk. In order to make the most of our trip (and not waste money on cabs), we wanted to stay at a prime location on the Strip. YOU MIGHT ALSO LIKE: The Bellagio Las Vegas in July - Hot Hot Hot! 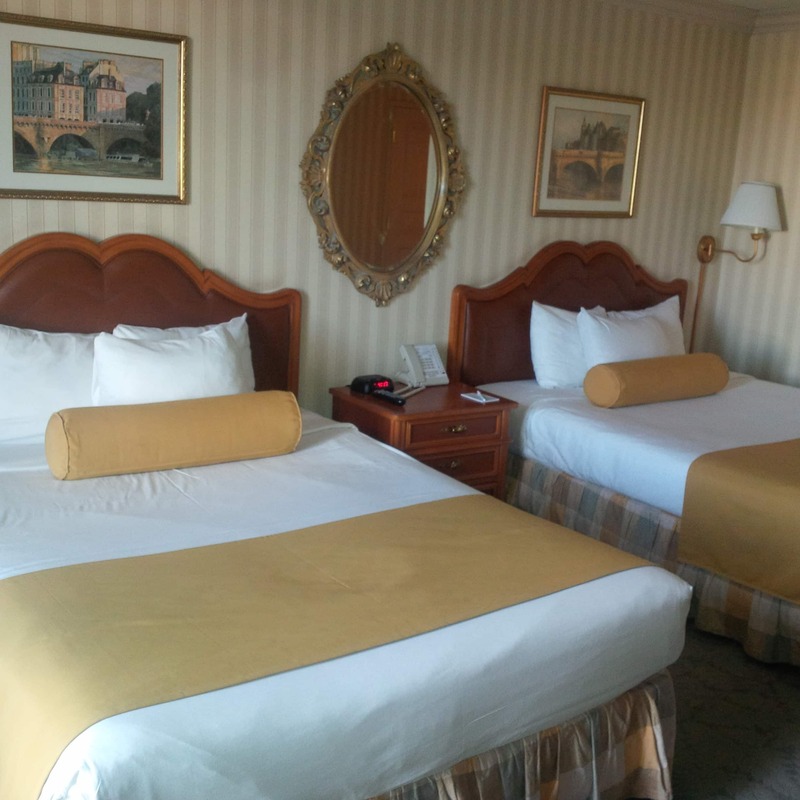 Our room at Paris Las Vegas. 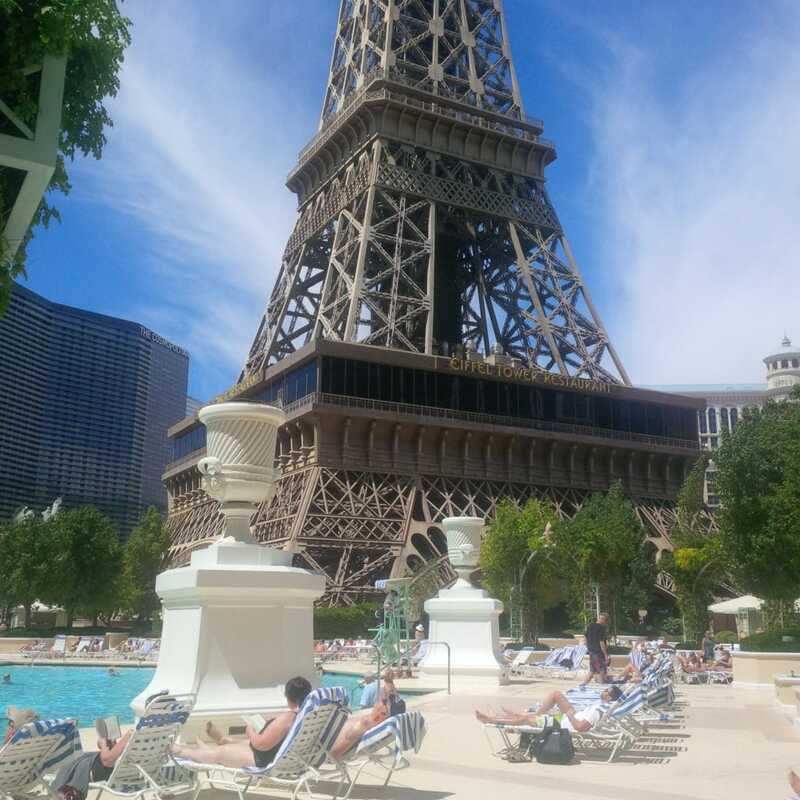 We were able to get a good deal on a room at Paris for our Vegas vacation. We were going to be in Paris quite a bit anyway. Napoleon’s Dueling Piano Bar is one of my favorite places to spend an evening in Vegas. Plus, we were going to see Jersey Boys which is also in Paris. This isn’t to say that Mandalay Bay or others hotels on either end of the Strip wouldn’t be a good idea. You just need to consider what you will be doing while you are in Vegas and realize that it does take time to walk from one hotel to the next. You may also be able to find Vegas travel deals by booking a hotel and air package through Southwest Vacations. (Click here to check out the prices and availability for Las Vegas vacation packages). We knew that Paris was not as luxurious as other hotels on the Strip, but it worked for us. Although the room was dated, it was clean and we had plenty of room. The bathroom was also a bit awkward because it had a plain bathtub and a small shower. The shower was so small that it was even difficult to shave my legs. In summary, there are many reasons for picking a hotel – luxury, price, in-hotel attractions, and location. Make sure you know which of these items is a priority to you. I love walking on vacation because you can see and absorb so much more than when you are in a cab. Plus, it can be good exercise. One day, between my morning jog and afternoon of walking to the Welcome to Vegas sign, I logged 13 miles. Of course, in the morning I was wearing running shoes, but in the afternoon, I made sure to wear some very comfortable Sperrys. Also, one night we went out to Hyde at the Bellagio and I carried my large Longchamp bag. That way we could wear walking shoes and then we switch into our heels. Even though you may want to look cute the entire time, remember that there is nothing cute about someone who is limping along as they walk or grimacing in pain. You can always sit down at one of the slot machines and change shoes. We decided that we wanted to see Jersey Boys, but hadn’t purchased the tickets before arriving in Vegas. Since we were going to see the show on Sunday night, it was likely we could get discounted tickets the day of the show. Although the show could have sold out, we decided to risk it. Worst case, we could pick an alternative show. The purchasing experience at Tix4Tonight was actually easy. We were walking along the Strip to go from Paris to the Venetian and saw the booth. So we stopped to get tickets. At Tix4Tonight, you purchase a coupon for the show that you want which can be redeemed at the box office for tickets. You are able to choose if you want orchestra, mezzanine, or balcony seats (if available), but your seats are not assigned until you redeem the coupon. They recommended that we get to the box office early to get the best seats, but we waited until after we had lunch at Bouchon. Then on our way back to our hotel, we stopped by the box office. We still got great seats on the fifth row! Although we were not in the middle section, we could still see everything. Getting the coupon and then having to go redeem it at the box office could have been a bit of a hassle if we had not been staying in a central location. So again this goes back to the first tip. One of my favorite budget savers is to have some food and/or drinks in the room. Michelle and I decided that we would do a bit of drinking in the hotel room during our Las Vegas girls trip. Who doesn’t need a cocktail when getting ready to go out? I packed a bottle of Schramsberg Blanc de Blancs in my suitcase using a wineskin, and since we were flying Southwest, we could check the bag for free. While I was waiting to retrieve my bag, Michelle stopped at the airport liquor store and bought a bottle of vodka. On our first day, we stopped at Walgreens to pick up some snacks and a few more mixers. I had packed a few already. 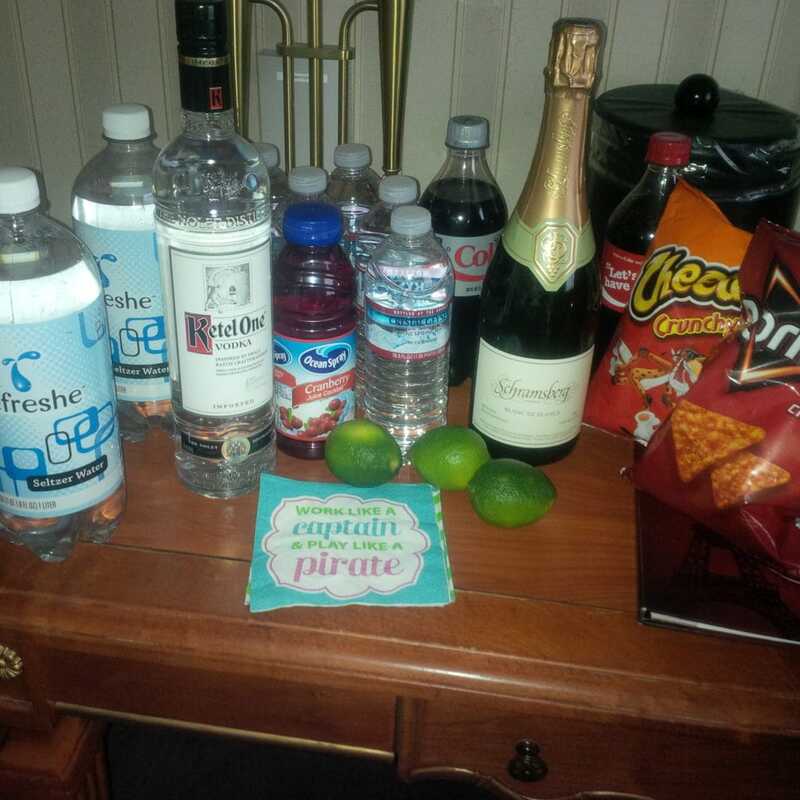 I enjoyed our set up and it was great to be able to pour a drink or have a snack whenever we were in the room. Plus, it helped keep our Las Vegas trip cost down. Since most of the Vegas hotels are huge, you can waste precious time going to and from your hotel room. We were in room 553 at Paris. At first, you might think this wasn’t a good location since it was a low floor. It turned out well though. The elevator ride was shorter since we didn’t have to stop at many other floors on the way up to our room. Also, we were just a few rooms down the hall from the elevator. Each night I was so tired when we got back to the room, that I just went right to sleep. I honestly do not remember if we could hear people walking down the halls, but I slept well. After we saw Jersey Boys, we needed to use the restroom before going out. There was a line at the theater, so instead, we just went back up to our room. While we were up there, we made another vodka soda. I couldn’t have asked for a better location. 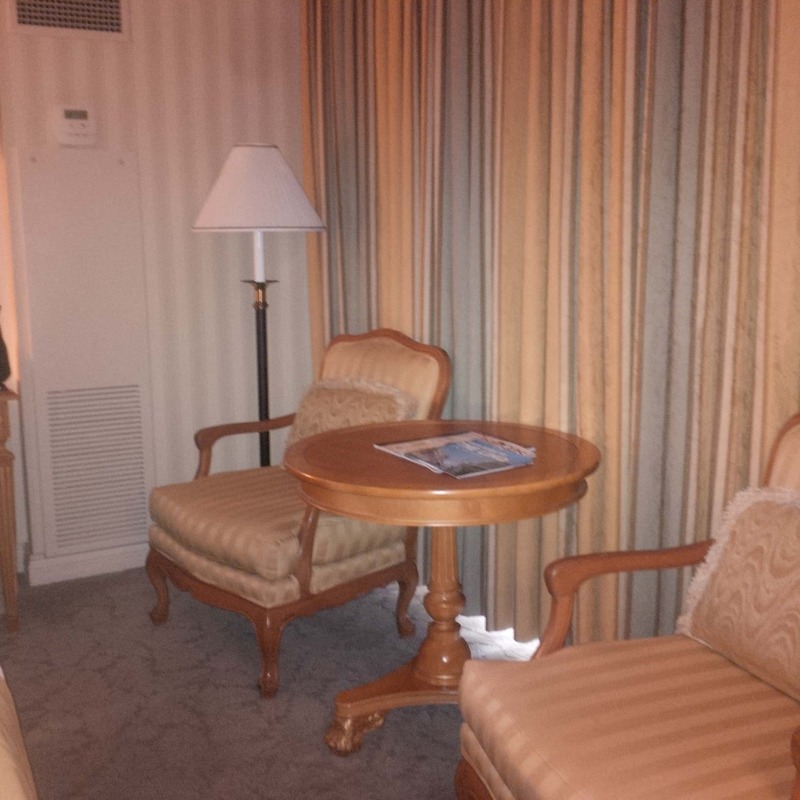 The room at Paris was a bit dated but clean. Vegas can be a super fun vacation, but planning a Vegas trip is different. It’s not like any other city, so you have to adjust your mindset. I hope that my tips help you plan a trip to Vegas. What other tips do you have for Vegas? Have a plan of what you want to do and see before you choose a hotel. Alternatively, choose a hotel and then pick things that are convenient. Don’t pay full price for a show, head to Tix4Tonight. Pack some drinks or pick up some at a store, so that you can relax and pre-game in your room. Check out our printable travel planning checklist to help make sure you don’t forget anything when you plan your Las Vegas trip. 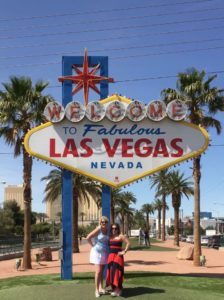 For more ideas of things to do and see in Vegas, check out Katherine’s post about her stay at the Bellagio. Katherine! You look so great in red. Wow sounds like the best trip, and those are some really important tips. Will keep it in mind when I book my next trip. Yes Vegas is always a good time! I would have never thought to bring a big bag so that I could change into cute shoes after walking a long way. Great tip! Glad to help! That tips works well also in other cities where you have to walk alot like New York City, London, etc. We’ve heard about the Paris Hotel but we’ve never been there. Thanks for your tips! You are welcome. We mainly stayed at Paris because of the price and location. Depending on your priorities, you may prefer other hotels.